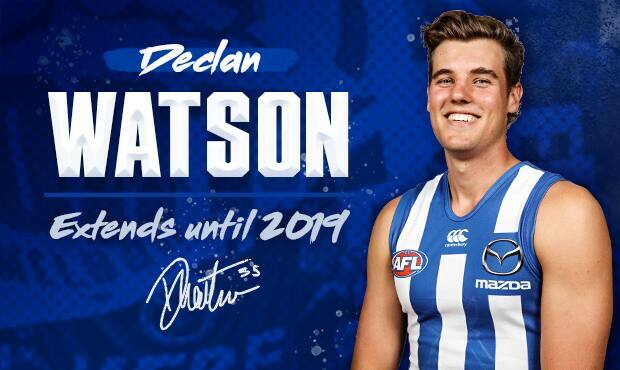 Despite a desperate attempt to return to the field after a 12-month stint on the sidelines, Declan Watson has been gifted valuable time in his comeback bid with a new one-year deal. The 19-year-old suffered an ACL injury at training in July last year following some strong form in the VFL. Out of contract at season's end, Watson said he was in a race against time to play some football this year and show he was worth another deal. “Initially I was pretty keen to get back and prove myself but as of last week, talking to Scotty [Brad Scott] and Joycey [Cameron Joyce], they just gave me the one-year extension so there’s not really any pressure to prove myself now which is nice,” Watson told North Media. The new deal until the end of 2019 will allow Watson to solely focus on the remainder of his rehabilitation and a big pre-season campaign. Although his road to recovery has been long, Watson has drawn inspiration from a fellow teammate who has returned to senior football after a similar challenge. “It’s been great seeing Pauly’s [Paul Ahern's] impact on the senior side this year and its definitely someone I look up to in that sense, so hopefully I can have a similar role next year,” Watson added. North GM football Cameron Joyce said the club was conscious of not piling too much expectation on the 2016 draftee. “Given there'd only be a few rounds left in the season by the time he'd be ready to return, we felt it was a much better option to wrap him in cotton wool for the remainder of the year," Joyce said. "We wanted to make sure he didn't feel pressured to get back and offered him the new deal to put his mind at ease and give him some security." Joyce said Watson had started training with the main group. “Declan has been pulling up really well and showing some very encouraging signs for the future."